Announcing a new skipper on S/Y TABASCO, available for charter this winter in the Caribbean and for summer 2008 they will be chartering in New England. Captain Paul Preston has taken command of TABASCO, a custom-designed Baltic 76 pilot house cutter based in Antigua. Born in England and educated in the US, Captain Preston has a 25-year career in the yachting and hospitality industries. 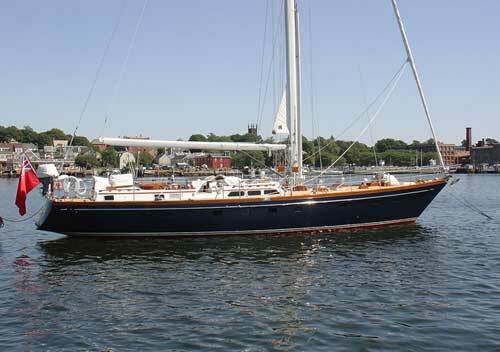 He has experience as captain of private and charter vessels, sail and power, up to 116 feet in length. Paul holds a USCG 1600 Gross Tons License and British DOT Certificate of Equivalent Competency with Class four Deck Command Endorsement. He has made an arrangement with a long-time colleague to freelance as chef on charter. Tabasco offers accommodations for six in three cabins forward of the main salon. The en suite master with a centerline queen is all the way forward. Just aft of the master suite are port and starboard guest cabins with one double berth each. These cabins share a bath with a glass-enclosed shower. All cabins have access to the port side sauna which also has a shower. View TABASCO's brochure : CLICK HERE and HERE TOO! We had a fabulous time aboard the Marolanga! Gus and Marcella were wonderful hosts. The yacht was comfortable, clean. The food was very good. I don't know how Marcella was able to create such meals in a small "kitchen"....every meal was delightful, pleasing to the eye and plentiful. I was also very impressed that they served our meals on china! We would love to take another charter. We stayed in St. Thomas, Charlotte Amalia. We stayed in a bed and breakfast called "At Home in the Tropics".....and that was definitely one of the highlights of our trip! I would highly recommend this place....we stayed two days before our charter and one day after our return. The owner, Pam Eckstein, was very accommodating. You may use us as a reference. Many thanks..........we now have wonderful memories! View MAROLANGA's brochure: CLICK HERE and HERE TOO! Flame had a close encounter whale sighting this week (Feb.2008) and wrote us a quick note about it... Hope we'll have some pictures soon. Pillsbury Sound is the stretch of water between St. Thomas & St. John, US Virgin Islands. February and March are the months to see the whales migrate through... If you'd like to give it a try, come on down! We are happy to have a new catamaran available for crewed yacht charters in the Mediterranean this summer (2008)... the 75-foot Privilege catamaran, Matau. This would be a great Valentine's gift. Book before the end of February 2008. The discount is applied to the lower priced cabin when booking the 2 cabin offer and no more than 2 single passengers on one cruise. The 58-foot catamaran, Alidade, is currently open for the end of February, EASTER, and prime weeks in April and May 2008. ALIDADE’s accommodations for eight are flexible in four cabins, each with ensuite heads: Two aft cabins have king berths, one of which converts to singles, two forward cabins have queen berths. ALIDADE's French crew, Captain Alain Guillaume (50) and Chef Eric Tournier (40) invite you to come enjoy one of the best times of the year for sailing in the Caribbean. Fresh breezes, lots of dolphins and a good chance of seeing migrating whales! Both Alain and Eric speak fluent English and Spanish, Eric also speaks German & Italian. For quieter fun, relax with DVD’s, board games, books and Play Station 2. View ALIDADE's brochure: CLICK HERE and HERE TOO! VALENTINE's DAY is next Thursday! Want a quick romantic getaway for Valentine's day? Check out these yachts! Click on the boat's name to view their brochure. DEMOISELLES - Ready for charter in the Seychelles! A recent email from the owner reports that DEMOISELLES, an 88-foot Sparkman & Stephens, is in "splendid shape" after a four-month, $650,000+ refit. She is in the Seychelles and ready for charter. The beaches and snorkeling are fantastic in six national marine parks, two World Heritage Sites and many conservation areas among the 155 islands (mostly uninhabited) which include the largest raised coral atoll in the world. Demoiselles will be based in Mahe with plans to make her way around the islands. Guests can easily join the boat by helicopter or water service. Flights abound from all European cities as well as Dubai and other cities in the Middle East. Four convertible en suite guest cabins offer flexible accommodations for up 8 guests (or to 10 guests, if family). Each cabin’s double bed converts to two lower singles. Two cabins have one upper single pullman berth each. View Demoiselles brochures: CLICK HERE and HERE TOO! Captain Jonny Spector and Chef Meredith Hester's Christmas guests in the Grenadines had such a wonderful time that they have reserved the same dates for December 2008! "This has been the best sail we have had in 20 years. See you in Nantucket"
"Thank you for the perfect week - relaxing, laughing, wonderful food and memories!" - New Year's Charter, 2008. Mom, Dad and three kids in their 20's. St. Vincent - St. Vincent. Conundrum accommodates up to 6 guests in three cabins, each with ensuite heads. The aft master has double and single berths plus private cockpit access. There are two guest cabins forward; one with two lower twin berths, and the other with twin bunks (upper/lower singles). Bar and beverages are INCLUDED for Virgin Island charters! I was having an internet problem so I hit a random bookmark and went to the Merriam-Webster site. The top bit of news was the winners of "Word of the Year 2007" which was the word w00t. I know of a website called this but I've never heard anybody saying it so it was a surprise to me... but then, I'm no longer in the computer management/programmer work-a-day world. But, the point I'm getting at is that third place was Conundrum... Hurray! A good excuse to mention the wonderful charter yacht named Conundrum with the excellent crew of Captain Jonny Spector and Chef Meredith Hester's who's Christmas guests in the Grenadines had such a wonderful time that they have reserved the same dates for December 2008! See post (click here) for more about Conundrum. Interested in chartering a yacht for your next vacation? Contact Paradise Connections Yacht Charters. It's Groundhog day again! Will Monday be a bank holiday? He saw his shadow so you know what that means... Yep, 6 more weeks of wintery weather. Remember, if you want to leave your particular winter wonderground and come on down to the islands for a quick getaway, contact us about a crewed yacht charter sailing vacation. CLICK HERE for our contact info!